Observatory Hill, The Rocks, Sydney City. “HOMELESSNESS” is an out of gallery project by Ruark Lewis & Jo Holder in association with the S.H. Ervin Gallery at the National Trust building on Observatory Hill in The Rocks. The project incorporated a nightly text illumination that utilises the eastern façade of the National Trust building on Observatory Hill in what the artist describes as an “alternative surface to publish on”. Artist Ruark Lewis and writer-curator Jo Holder undertook a series of ephemeral art works that take up the idea and form of a public conversation. The first public interest issue opened-up for discussion is the policy of ‘selling-off’ Public Housing in inner-city Sydney. Ruark Lewis is an installation artist whose work engages the community by using the placement of poetic ideas in public spaces as social cues. 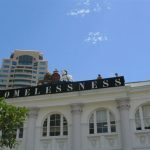 His ongoing social project, AN INDEX OF KINDNESS incorporates various site specific works in and around the City of Sydney. The aim of the project was to illuminate the difficulty that homeless people face by using poetic/political agit-prop. Called ‘Housing the Seafaring Nation’, the installations and events re-inscribe the importance of the maritime community in Millers Point at the foot of the Harbour Bridge, which is the oldest urban grouping in Australian/European settlement history. Ruark Lewis said: “the art project signals the hidden process of displacing a community and its heritage. This art is a way to help form the public discussion. I hope that the act of artistic play will illuminate the government’s tactical delay on dealing with the issues of public housing in New South Wales”. ‘Housing the Seafaring Nation’ consists of a series of installed poetry artworks and a round-table public discussion. The colourful artworks are ‘inscribed’ in the form of pattern poetry and attached to the facades of three key local buildings. 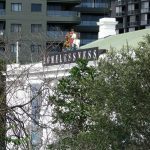 A monumental frieze on the parapet of the National Trust headquarters on Observatory Hill spells out HOMELESSNESS, the giant letters enabling easy reading by motorists crossing the Harbour Bridge. 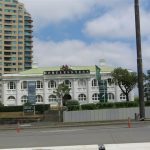 A sequence of 5 billboards have been installed on other historic community buildings in Millers Point: the Abraham Mott Hall and the Older Women’s Network centre. These services symbolise an earlier era of civic activism in Sydney when a local man Abraham Mott led the residents to found a welfare centre in the former Coal Lumpers’ Hall and build a baby health centre. These language art works are an open-ended tool designed to generate a political thinking. In this way, public spaces are re-appropriated in order to mobilise opposition to the incursion of private interests and community places are restored as sites of public discourse. The Millers Point billboards recalled the patterning of maritime pilot markers rendered as a kind of pattern poetry. These navigational block are ‘signals’ positioned along the shoreline to direct tugs pulling ships. Seagoing vessels are paradoxical symbols of temporary homes and homelessness, independence and interdependence. Seafarers, everyone agrees, are different. Set beside the pattern poems are two storyboards formed from interviews and conversations with local people. They speak about the ideals of public housing. Lewis and Holder inscribed the voices to form a kind of living historic index. What they refer to as An Index of Kind-ness. These open-ended poetic works aim to shape the area’s playful political language and resistant spirit. 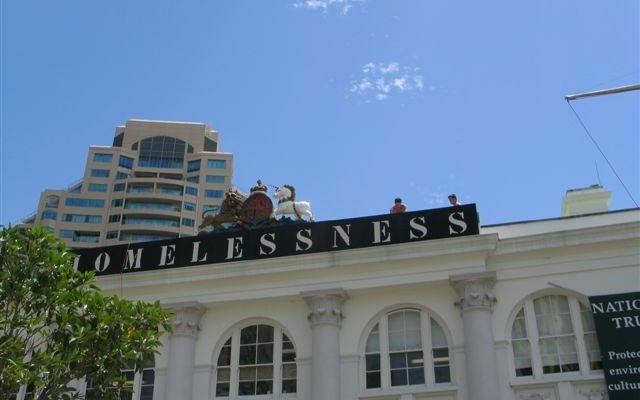 “HOMELESSNESS “ stands atop the National Trust of Australia (NSW) headquarters from January 2009 the frieze will be in place during S.H. Ervin Gallery’s summer exhibition Timeless: the art of Cressida Campbell. Ruark Lewis is renowned for his linking of art, poetics and political discussions. His method, which he calls “transcription (drawing)”, often takes the work of other artists—composers, poets, choreographers, anthropologists and fellow visual artists—and transforms it into abstracted text embodied in sculptural installations. Often, too, he works on collaborations. He created RAFT with Paul Carter for the Art Gallery of New South Wales and other commissioned works—for the 2000 Sydney Olympics, 2006 Biennale of Sydney and Performance Space at Carriageworks. He collaborated with Jonathan Jones on an installation called An Index of Kindness at Post-Museum in Singapore 2007 and in October 2008 he created a commissioned installation called ‘Euphemisms for the Intimate Enemy’ for Toronto’s Nuit Blanche festival. This project has antecedents in projects by artists like Krzysztof Wodiczko’s ‘Public Projections’ of homelessness and sites of urban revitalization in New York and more recent works by artists that introduce observations about the unsettling dichotomies of urban life around the world. In 1982 the Maritime Services Board (MSB) gifted this unique collection of housing and community buildings to the NSW Department of Housing. The idea was to better maintain and manage Millers Point and The Rocks as a heritage site. The DOH took over control of everything—houses, hotels, and the community buildings. They did a great job and started upgrading the buildings. In 1990 the National Trust proposed that the entire area be added to the National Estate for World Heritage listing. Prime Minister Bob Hawke said he was “actively pursuing the matter”. As recently as 2002 a Department Draft Report on Millers Point actively canvassed ways to retain public housing and a conservation agenda. This trust has slowly been betrayed. The department began an unofficial trend of denying modest and low-income earners access to public housing. Houses are slowly emptied and run-down thereby generating the pretext to relocate tenants. In 2005 the then Housing Minister Joe Tripodi introduced an aggressive sales campaign for Millers Point. Instead of canvassing innovative ways of maintaining and conserving public housing and encourage mixed-income communities in the inner-city, the public debates and alternate ideas were scorned. In January 2007 the sell-off of sixteen 99-year leases on heritage properties in Millers Point was announced. In November 2008 a large terrace at 59 Lower Fort Street was sold for $1.5 million. The Government said that the proceeds would go to “five affordable housing properties in the inner-west”. In the future this boarding house accommodating 6 people on fixed incomes will become a luxury private residence. Millers Point has a history of significant counterpoints between the dissident voice, the resistant voice and the government and the developers. In 1968, the state gave control of The Rocks to the Sydney Cove Redevelopment Authority, with the intention of demolishing the original buildings and re-developing them as high-density residential dwellings. In 1971, residents formed the Rocks Residents Group to oppose the plans. They felt that they would be forced out. They requested a Green ban from the Builder’s Labourers Federation and other unions. This launched the world-wide Green Bans movement. This was followed by a successful 8-year legal battle in the 1980s against development. In 2000 a massive $2 billion development on the 17 remaining hectares of the city’s remaining cargo docks (along the Hungary Mile renamed Barangaroo) was announced. Gentrification, a term coined in London in the 1960s, implies self-serving class interests at work — usually financial institutions, politicians and developers. This is not an isolated situation and clearly other vulnerable groups and communities of the inner-city are threatened. All too often, architects, planners and city councillors execute the gentrification task and contentedly restrict their role to merely discussing aesthetics (height, bulk, style etc). This neglect of the city’s social structure only contributes to the persistence of housing inequality, a monoculture of luxury housing buildings and on-going lavish self-glorification by city elites.